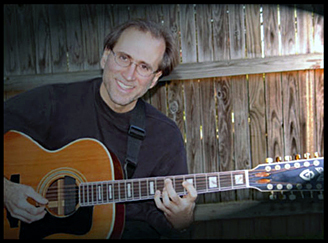 Pete began teaching music in 1974 as a senior at Langley High School in McLean, Virginia, when a fellow classmate, Jon Brundage, asked Pete to teach him guitar. (They have since played together in rock bands at their high school reunions.) In the mid 1970s, Pete taught bass guitar to Michael Manring, when Michael was in his mid-teens. "Michael, from the day I met him, was already on the path of being a devoted, inquisitive and creative musician," says Pete. "Michael never wavered from that path and so he has become the most innovative bass guitarist on the planet." By 1979, Pete had built up a roster of more than thirty students, whom he taught at their homes, at his residence, and at the Music & Arts Center. In June of 1980, Pete established his own home studio in West McLean, where he has continued to teach since then. Pete has taught guitar, piano, bass guitar, theory, and improvisation to several thousand students over the years, and he has sometimes taught mandolin, banjo, hammered dulcimer, double bass, composition, and arranging. Many of Pete’s former students have gone on to pursue careers in music, including Vyktoria Keating (who has toured with Jethro Tull), Steve Hansgen (Minor Threat), Nerrisa Nields (The Nields), Blake Althen (Human Factor), Julie Murphy Wells (Eddie From Ohio), Mike H. (The Bravery), Ryan and Hays Holladay of Bluebrain, and Benny Blanco (producer and songwriter). Since the 1980s, Pete has also taught bass guitar and guitar to students attending Northern Virginia Community College in Applied Strings. In 1986, Pete began to also teach groups of students. In 1997, he began rehearsing and producing projects for rock-based ensembles. In 1991-92 and 2002-07, Pete taught guitar classes and one-on-one lessons in guitar, bass guitar, double bass, and mandolin at The Madeira School. In 2003, Pete’s home-based teaching business became known as Spring Hill Music Instruction LLC. Pete continues to teach one-on-one music lessons and now offers youth and teen summer ensemble workshops at Spring Hill Music Instruction LLC. Since the 1980s, Pete has been compiling an extensive music library at his studio, which includes more than 1,000 of his transcriptions and arrangements. In 1988, three of his transcriptions and accompanying articles were published in Bass Player (September/ October issue), and he has since been published several times in Bass Player. In 1990, Pete completed and published the chart The Natural Audible Harmonics or Overtones of the Bass Guitar (a fourteen-year project). In 1998, he sought out every issue of several leading publications for guitar, bass guitar, and keyboard to use as references in his instruction. In 2003, through Spring Hill Music Instruction, Pete published Learning Tools for the Aspiring Musician, which is in essence a reference manual (mostly for bass guitarists and guitarists). Each book is customized for the student from more than 100 "tools" that evolved for the most part from lessons Pete has taught over the years. In 2004, also through Spring Hill Music Instruction, Pete published an easy-to-use Grand Staff, which is an educational tool that he developed in collaboration with his former piano students Christine and Kathleen Ryan. In July 2006, Pete was on board with National Guitar Workshop, teaching bass guitar in New Milford, CT, and as an assistant director in McLean, VA. In 2013-14, Pete taught music (including composition, theory, and history) at Northern Virginia Community College in Sterling, VA. In 2014, Pete began teaching music at The Newton School (grades K-8) in Sterling, VA. Note: if you previously studied with Pete, you may contact him to receive free updates of any handouts or transcriptions that he gave you. The updates have been carefully edited and expanded to shed more light on concepts and to serve as essential learning tools for musicians.